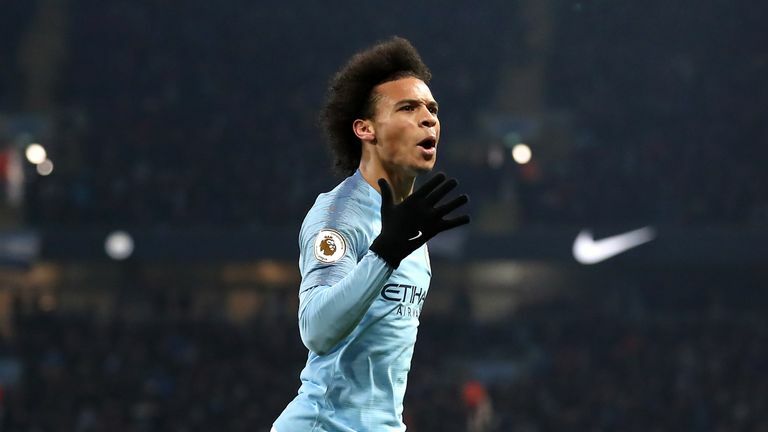 Graeme Souness says Pep Guardiola has "lit a fire" under Leroy Sane and Manchester City are now profiting from his recent performances. Sane was among the scorers as City breezed past managerless Huddersfield 3-0 on Super Sunday, closing the gap to league leaders Liverpool back to four points. He floated in and out of the game but when he was at the forefront, Sane took Huddersfield apart and also provided an assist for Raheem Sterling. The German has now scored seven goals and grabbed nine assists in his last 17 Premier League appearances. After a slow start to the season where Sane started all of City's first three league games on the bench, Guardiola has put faith in the player and he is now repaying that trust. "There was something in his make-up that he needs that fire lighting," Souness said on Super Sunday. "He didn't go to the World Cup and Pep left him out at the beginning. Maybe it was the way he trained? Or his timekeeping? But Pep has lit the fire under him and Manchester City are getting the benefits in the second half of the season." The 23-year-old winger's total of 13 assists in all competitions for City this season is more than Lionel Messi has achieved for Barcelona during the current campaign. In total, Sane has 23 Premier League assists to his name since the start of last season - which is five more than any other player in the City side. Alex Scott - who was a guest in the Super Sunday studio - thinks there is even more to come from the winger. "He is huge for City - he can change a game in a flash," she said. "Pep knows he has to keep working on him, keep pushing him as he knows he's not the finished article. He still needs work and he's under the guidance of a great manager."